Every time you make a donation, volunteer, or donate books to The Children's Book Bank, you #InspireJasper. Jasper started life with a speech delay. He had trouble talking and made up his own words that only his parents could understand, like calling windows “nunos.” As he got older his early struggles with language turned into challenges with reading. He excelled at math and science, but avoided books and reading and relied heavily on his parents to help with school work, nevertheless falling further and further behind his classmates. That all began to change when Jasper got to choose a collection of books from The Children’s Book Bank to take home and keep. 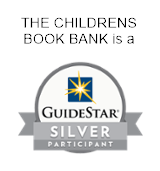 Make a donation by clicking here, by visiting giveguide.org/#childrensbookbank, or by mailing a check payable to The Children’s Book Bank to 2680 SW Ravensview Drive; Portland, OR 97201. Volunteer to help clean books. Visit Hands On Greater Portland to sign up for one of our regularly scheduled sessions. Give new or gently used children’s books at 1728 NE Glisan Street (see hours). Share why you #InspireJasper. Print this sign and add your reason for supporting CBB. Then take a picture with your sign and share it on Facebook, Twitter, Instagram or your other social media. Or share it directly with CBB using this form. Follow CBB social media to hear about other community members who #InspireJasper! Thanks to everyone who helped #InspireJasper as part of #OregoniansGive on #GivingTuesday! One of the books was Daniel’s Story, a book about a young boy in the Holocaust. Jasper read it. Then he read it again. And again. And again. Four times total, front to back. When Jasper returned to school the next fall, he was fascinated to learn that the school library had a whole section of books similar to Daniel’s Story—the one he now kept in his backpack to read on occasion. He checked out a new book. A few weeks later, he checked out another book—and another, and another—reading more than 12 books throughout the school year, as each piqued his curiosity about the world. Now Jasper loves to read and is excelling in school. Sparked by Daniel’s Story, Jasper became a reader, not just someone who can read, but someone who seeks out books to answer questions, to learn about the world, and to imagine other possibilities. Many thanks to our sponsors and partners for helping #InspireJasper!